Week 8 was a tough one. It didn’t start out very well. 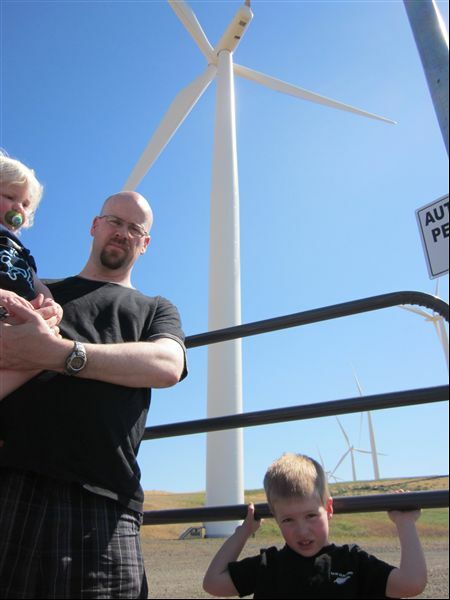 We were returning home to Oregon from Washington when we stopped to look at the amazing windmills near The Dalles. When we got back into our car, it just wouldn’t go. It was a very hot day & we were a bit off the beaten path. There was a bit of drama, but after about 3 hours in near 100 degree heat, with the boys, AAA came through & we were towed to The Dalles where our car was to be fixed the following day. We were all very hot & thirsty – we quickly went through all the liquid we had in our car, including our emergency water. So thankful for a lady named Tina who stopped & gave us water. Always keep lots of water in your car! Windmill! Very cool. We had lots of time to look at them. We made it to town, got the car fixed the next day & arrived safely at home. It was an adventure! However, it meant that I didn’t get Week 8, Day 1 run in. I thought about doubling up, but figured that it would probably be counter-productive. So I did two runs in Week 8 instead of three. 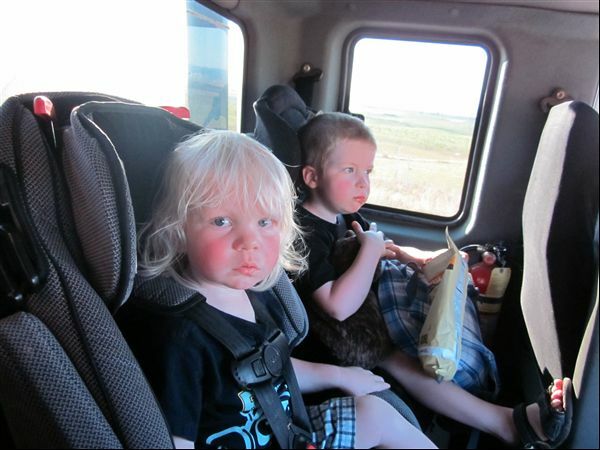 In the tow truck with two very hot, hungry tired boys. They were troopers. Because of all the trouble I have with my feet, I had the brilliant idea to wear some serious, heavy-duty insoles for my first run of the week. It was a terrible idea! I was in pain for the entire run & could barely walk home after I had finished running. My last run of the week was better. It’s hard to believe I only have one week left in the program & that I’ll be running 30 minutes in a row! That’s a Bucket List item. Woohoo! Phew! Made it through another week. The first two runs were pretty easy, but the last run of the week was a real mental battle. It wasn’t pretty & it sure wasn’t very fast, but I did it! I think it might have been more of a struggle because from here on out there are no walk/run intervals – it’s all running from now on (apart from the 5 minute warm up walk), just increasing times. It’s tough to do the start & stop thing with walking & running, but there is definitely a certain comfort level in knowing that you’ll be able to take a break in a couple of minutes. When there’s no break coming, you have to battle through mentally. I was surprised to find that, towards the end of the 25 minute run, it was my legs that were having a harder time than my lungs. I’ve always thought I didn’t have much in the way of lung power & that I was quite strong. I see now that my muscles are going to have to do some catching up. Praying for increased strength, endurance, good sleep & an end to the sore throat/ear thing that I’ve had for about 4 weeks now. Wow! I made it through week 5, I’ve officially gone further in the program now than in my previous two attempts. I quit after day 2 of Week 5 last time due to illness. It’s a bit ironic, but I’ve been really ill again this time. I have a sore throat that just isn’t budging with pain in my ears & a bit of a cough. I powered through though & I am so glad I did. On day 3, I ran for twenty minutes in a row without stopping. I wasn’t sure if my legs or my lungs were going to give out first! It is an amazing thing, though, that after a certain distance, you start to get a second wind or something. It was still tough, but I felt like I was going to make it. It seemed a bit strange for there to be such a big jump in the time running without a break, but it worked. I think it’s actually more difficult in some ways to do the start & stop thing with running. Once you have the momentum, it’s hard to stop & walk & then get going again. It’s similar next week, but with longer times so we shall see! I’m praying for health. I’ve been trying to get more sleep this weekend as that seems to be my weak point. Bring on Week 6!